We’re already jealous of the Scandinavians for their thriving sauna culture, flat-pack furniture and impeccable crime dramas. Now there’s something else to add to the list—their accessories. The Scandis have an uncanny knack for hunting down handbag labels and small jewellers that are pleasingly under the radar. This means if you follow Pernille Teisbaek and Darja Barannik on Instagram, you’re bang up-to-date with their latest finds and in constant danger of falling down a rabbit hole of accessories every time you scroll. It’s a risky business—and why my to-do list has a page of links to things like “glitter hair clips” and “pearl hoop earrings” at the bottom. The good news for my bank balance is that they’re not all designer. The Scandis might be partial to Balenciaga Knife Boots here and a J.W.Anderson Disc Bag there, but they’re also staunch supporters of homegrown talents like Sophie Bille Brahe and Anni Lu. What they do with these gems is another story: The French have a reputation for being effortless dressers, but when it comes to puzzling together outfits that are perfectly balanced with accessories, the Scandis win. See Teisbaek giving knits a lift with a collection of textured gold rings by Orit Elhanati, and Hannah Mw using a Kanel Demark bow-shaped barrette as the crowning glory on an outfit of Acne checks. If all this talk about handbags and hair clips has you in the mood to shop, keep scrolling for the 9 best places to stock up on Scandi-approved accessories. The Scandis have all become girls with pearl earrings after the rise of Danish jeweller Helle Vestergaard Poulsen (aka Anni Lu). Her baroque earrings—made with freshwater pearls set with coral, turquoise, ruby or green agate and hung from a teeny gold shell—have already done the Instagram rounds. Not just for summer months. Layer this with other gold chain bracelets and team with your everyday denim. Wear these beauties with anything from puffer jackets and patterned skirts to striped shirts and straight-legged jeans. Our childhood dreams have come true with this bracelet, and our 30-something, year-old self totally approves. Scandi girls are all about making a serious stomp when it comes to footwear with their heavy duty boots and sneakers. It's party down to 5-year-old brand Eytys (pronounced 80's). We're most into the white-out sneakers that easily add another 10cm in height. The Chelsea boot just underwent a heavy duty make-over and the result is seriously cool. Scandi's thrive off of seriously extra sneakers and these are just one of the pairs you'll find in one of their extensive wardrobes. The Scandis have brought back hair accessories in a big way. It started with the Danish label Saks Potts dressing their models’ updos with colourful sausage clips—the kind you used to wear playing netball. Now the latest must-haves are Kanel Denmark’s glittering slides and flower barrettes. Position a pair on one side of your parting and you’ll look Scandinavian from the neck up. I didn't think it was possible to have a minimal diamante flower piece. This could have only come from the Scandis. Give hair clips a go with this rose-coloured acetate slide. This diamanté-studded clip tortoise print is just the ticket to give chunky beige knits and printed trousers an extra-Scandi edge. This accessories label has almost become synonymous with Scandi street stylers, but its founders are actually from Montréal and Bangkok. The brand has flagship stores in Bangkok and Copenhagen, which explains why the Danish girls are big fans of Boyy. The giant buckle is Boyy's signature style and this padded Bobby update is just the winter slant we were looking for. Not just renowned for the outstanding bags, Boyy are also totally nailing footwear too. The Deon bucket is quickly becoming one of our favourite styles from Boyy, and this pale pink colour is something the Scandi Instagram crowd would certainly approve of. Clusters of delicate pendants and giant door-knocker earrings—all in gold—come highly recommend by Copenhagen’s finest, Pernille Teisbaek. One of her favourite labels is Danish goldsmith Orit Elhanti, whose 18-karat-gold pieces are inspired by childhood summers spent in Tel Aviv. You'll have noticed all of our favourite Scandi girls love gold chains, and these hoops are the key to being one step ahead. This textured gold oval earring will go with everything from cable-knit cardigans to silk cocktail dresses. Layer this beautiful spiral pendant with at least five other finer chains and necklaces to resemble that considered Scandi layering. MC Davidian is another favourite for hair accessories, but this time it’s French. Annabel Rosendahl often wears the handmade barrettes, which are really playful. You'll find clips in the shape of sausage dogs, seahorses, dolphins and shells. Scandinavian girls are known for throwing an unexpected element into their otherwise minimal look, which is why this sausage dog hair clip will be the ideal finish to a chunky knit and trench coat. This embellished hair clip is the stylish way to keep your hair out of your eyes for the daytime and through to the night. The colour green is having a serious moment right now among the Scandis, and this is the simplest way to give it a go. You’d be hard pushed to find a Danish street styler who doesn’t have something by Sophie Bille Brahe in her jewellery box. 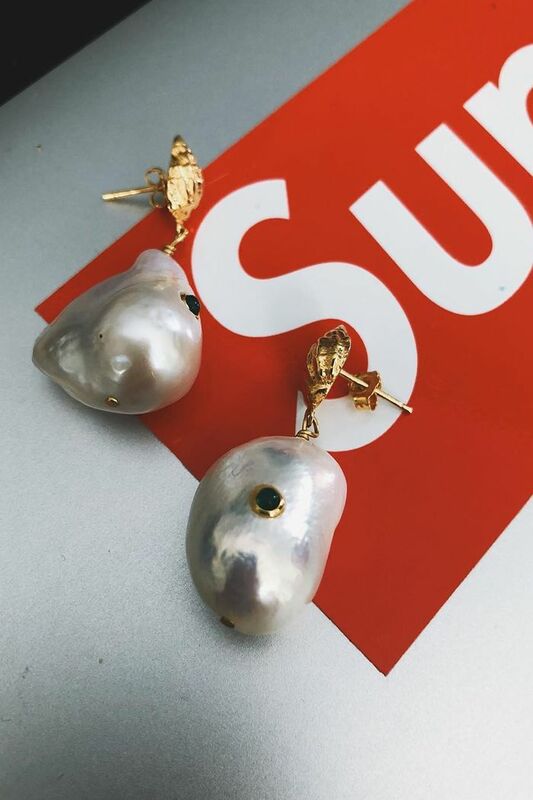 The designer is famous for making pearls something you don’t have to wear with a twinset, turning them into ear crawlers that look like peas in a pod and single earrings made out of twisted 14-karat gold with mismatched pearly ends. We're thrilled our favourite Scandi- jewellery brand is also doing hair pins. The Botticeilli earring is a more entry-level price point that we'd happily wear with anything. This stand out pearl drop spine earring will go with everything from denim during the day to being the perfect finishing touch for a black tie event. Man Repeller’s Leandra Medine summed it up perfectly when she posted her New Balance trainers on Instagram with the caption: “Am I Scandinavian yet?” These particular kicks, especially the grey version, are a uniform for the Scandi style set. Wear yours with everything from pleated skirts and sweatshirts to floral dresses and sparkly socks. We're so into the new X-90 shape of these sneakers. This mix of colours is giving us serious vintage feels and you can pick these up for just £75. Burgundy is actually classed as a neutral according to the Scandi style rules. Novelty boy-like socks are big news in Scandi land, but if these are a little too boyish for you, you'll be thrilled Baum und Pferdgarten also stock other killer affordable accessories, from under £200 Insta-worthy bags and printed scarves ideal for layering over chunky knits. Give strangers on the escalator behind you something to smile about with Baum’s Lois sock, which has “Just Peachy” on one foot and “Jolly Good” on the other. Leopard print is huge among our favourite Scandi influencers right now. This polka dot scarf comes in at least three other colour-ways that make them ideal for layering over any look.